New in 2016: Calgary Poet Laureate derek beaulieu, in partnership with Barrie Poet Laureate damian lopes, issues a friendly challenge to Poets Laureate across Canada! Check it out here. To celebrate National Poetry Month and UNESCO World Poetry Day, each year municipalities across Canada are challenged to bring poetry into politics. 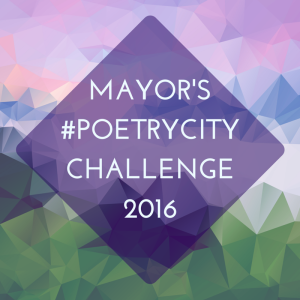 One mayor leads this annual challenge by inviting a poet to read at a council meeting in March or April, and challenges mayors and councils across the nation to follow suit and join the celebration. Initiated by Regina Mayor Pat Fiacco in 2012, the Mayor’s Poetry City Challenge celebrates poetry, writing, small presses and the contribution of poets and all writers to the rich cultural life in our country. Last year the torch was passed from Regina to Calgary, and Mayor Nenshi’s first challenge was a huge success. With over seventy participants, the 2015 challenge was our largest yet—but we hope for even more in 2016! This year’s challenge is a collaboration between the League of Canadian Poets, The City of Calgary, and the Writers’ Guild of Alberta, with the support of Loft 112. Follow the League on Twitter, Facebook, and Instagram, and track the hashtag #PoetryCity to get involved! Communities participating in the 2016 challenge will be added to this page as we receive their confirmation. Find out more about the 2015 challenge here, or the 2014 challenge here. Brantford ON, Brooks AB, Caraquet NB, Cobourg ON, Dauphin MB, Drummondville QC, Happy Valley-Goose Bay NL, La Ronge SK, Nanaimo BC, New Westminster BC, North Battleford SK, Powell River BC, Spruce Grove AB, St John’s NL, Victoria BC, Windsor ON, Melfort SK, Regina SK, Wolfville NS, Oshawa ON, White Rock BC. Barrie ON, Brantford ON, Caraquet ON, Cobourg ON, Dauphin MB, Grande Prairie AB, Happy Valley-Goose Bay NL, La Ronge SK, Medicine Hat AB, Nanaimo BC, New Westminster BC, North Battleford SK, Powell River BC, Sackville NB, St Catharines ON, St John’s NL, Vancouver BC, Victoria BC, Windsor ON, Toronto ON, Prince George BC, Melfort SK, Regina SK, Paradise NL, Eastend SK, Wolfville NS, Oshawa ON, Nelson BC, White Rock BC, Gatineau, QC, Kingston ON, Eston SK.